the very best cut, style and finish. Over 35 years experience cutting & finishing ladies and gents and running a high end salon. P.O.A. Over 5 year experience, colourist and stylist, specialises in gents cutting and styling. With over 30 years experience Giovanna is one of our top artistic directors. With over 18 years experience Catherine is a colour specialist. 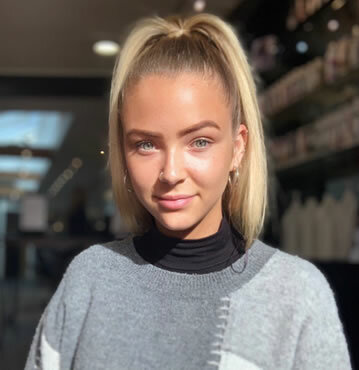 Sophie specialises in braids and hair up, colour and is a professional stylist. 30 years. Our leading salon has earned an excellent reputation for offering the very best in creative hairdressing and customer care in a relaxed and friendly environment. Our services include a complimentary conditioning and shiatsu head massage with every shampoo. We also give free fringe trims to regular clients and provide a complimentary hair cut check service with all restyles. This gives you the opportunity to come into the salon for a free wash and blowdry and make sure that you are completely satisfied with your new haircut. Professional advice is given on how to care for your hair in between salon visits and the Enzorosario hair shop has an extensive range of hair products including Paul Mitchell, G.H.D. Moroccanoil and Philip Kingsley. Here at EnzoRosario Hair Salon we take great pride in providing our clients with the very best service and in a relaxed friendly environment.